This hotel enjoys a strategic setting in Bakersfield. The hotel is set just off Highway 99. The hotel enjoys close proximity to a host of points of interest in the area. An abundance of shopping opportunities, dining options and entertainment venues can be found nearby. This hotel welcomes visitors with the promise of unrivalled comfort and convenience. The guest rooms are superbly designed, offering a comfortable setting in which to work and rest. The hotel boasts 1,700 squared feet of meeting space. A wide range of leisure, dining and business facilities are available at this hotel. Guests will appreciate the friendly service and high level of excellence that they are afforded. 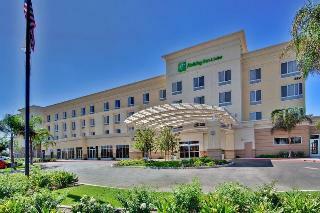 Welcome to the DoubleTree by Hilton Hotel Bakersfield. Begin your stay at this inviting hotel with our delicious fresh-baked DoubleTree cookie and allow our attentive staff to cater to your every need. 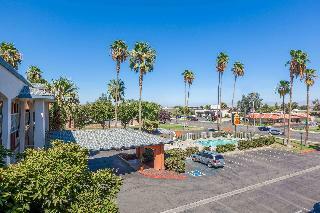 Situated within acres of beautiful landscaped gardens, and surrounded by palm trees and seasonal flowers, this Bakersfield hotel offers a resort-like oasis. 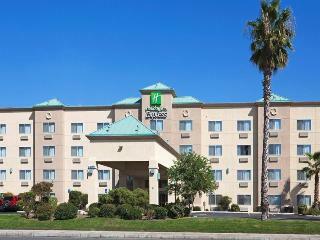 Ideally located only 10 minutes from Meadows Field Airport and just off the Rosedale Highway and Highway 99, the excellent location of the hotel provides easy access to all that Bakersfield has to offer. Visit local attractions such as Kern River and The Fox Theatre or remain in the hotel and lounge by the outdoor pool or work out in the fitness center.Host a meeting, conference, special event or wedding at the hotel with over 12,000 sq.ft. of flexible function space, including the largest ballroom in Bakersfield. Business is easy with our fully equipped business center, high-speed internet access and excellent range of high-tech equipment.Retire to a spacious guest room or suite at the hotel and enjoy stunning views overlooking the landscape from your private balcony. All rooms feature modern amenities including high-speed internet access and 42-inch flat-screen TVs.Indulge in a delicious meal at The CafÃ©, open daily for breakfast, lunch and dinner. Club Odyssey is the ideal place to spend the evening. Enjoy the weekly lineup of entertainment including salsa dancing, sport and live music or simply unwind at the bar with your favorite drink.